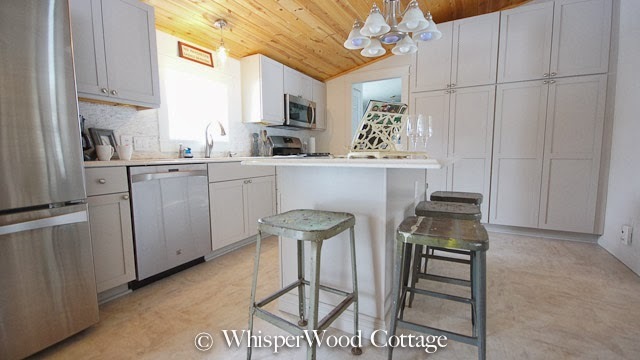 Except for the stools, the framed art above the sink, the ceiling, and the island light fixture, pretty much everything else in this kitchen has been replaced. I'm still looking for a different (new or vintage) island light fixture, but this one will have to do until I find exactly what I want. The industrial stools are flea market finds collected from multiple sources. We were able to add a lot of storage throughout the kitchen with taller cabinets, sliding shelves, more drawers, etc. We extended our island to make it a foot longer than the previous one. So much more functional! We can actually seat five people comfortably at the island now. 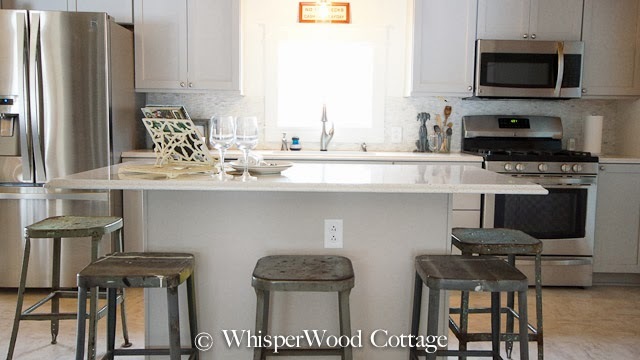 We are loving the clean style and grey color of the cabinets. The neutral color palette feels very clean, subdued, and sophisticated to me. 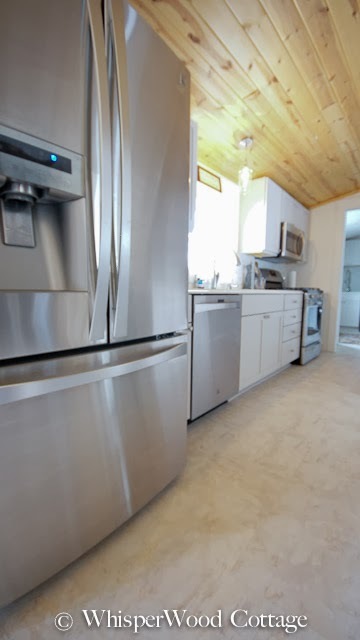 Stainless steel appliances replaced the previous outdated and barely functional ones. And, yes, I've actually been enjoying cooking and cleaning! Miracles do happen! 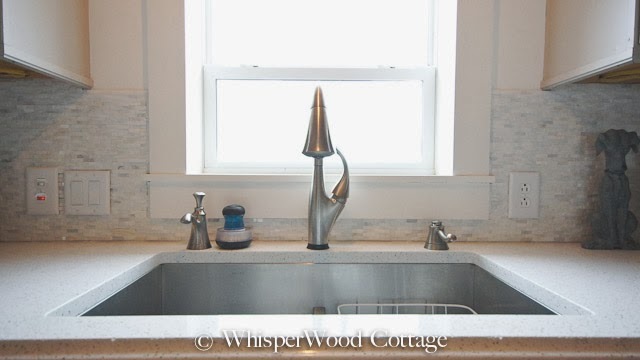 The backsplash is a cut marble tile, the stainless steel undermount sink is a dream, and the faucet is one that you can turn on and off just by touching it. 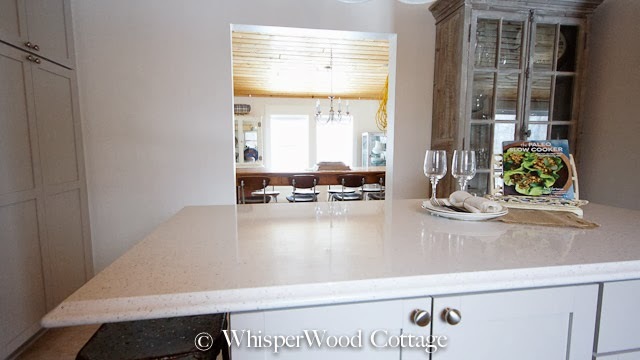 The countertops are quartz (the functionality granite, but half the price and no maintenance!). We kept the hardware simple with a basic knob is a stainless steel finish. 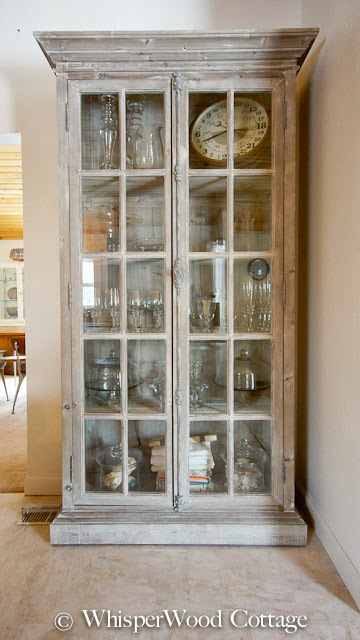 This french-inspired cabinet, made from reclaimed lumber, displays glassware and kitchen textiles. The floor is a high-end laminate product that replaced old white linoleum. It is much warmer to the feet and cleans so easily. It is the same flooring we used in the master bath renovation. Your kitchen is wonderful! 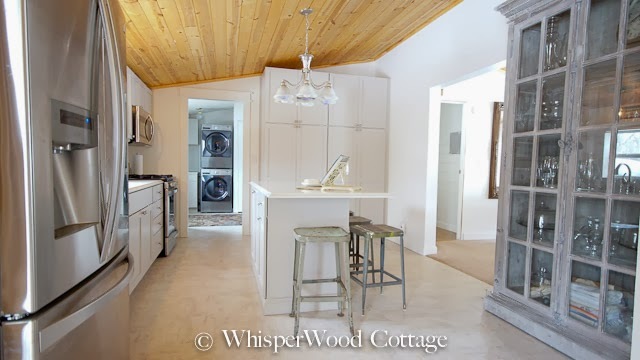 White kitchens are so pretty to start with but I think your wooden ceiling really warms up the space. Love the stainless and that gorgeous china cabinet. 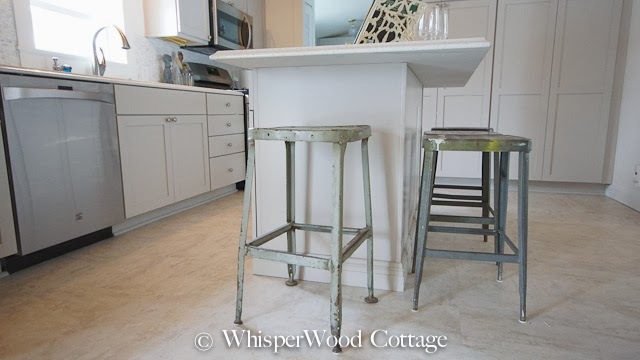 I would love to see some details regarding the reclaimed lumber unit and the tall cabinets that replaced counter space and overhead cabinets. Do you miss that counter space? It's very pretty. It's Sunset magazine's style. I don't know if you are familiar with that one. The original natural ceiling keeps it warm. 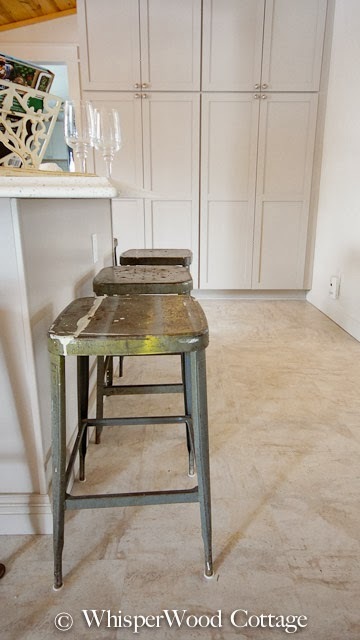 I love the china cabinet and the industrial stools. That also keeps it inviting. Amy, I have an interesting sidelight-I think your cabinets are the same as we used in our renovation-except our color is Bliss (lt green) Innmost is the brand name and the style is...sorry, forgot that one. We got ours at Home Depot. Can you tell me the brand of laminate flooring? Beyond in love with that cabinet... I drool over one just like it at Restoration Hardware every time I visit my dream furnishings there. Of course, the prices always slap me in the face like Cher did Nicolas Cage when she demanded that he, "SNAP OUT OF IT!" But seriously, it's gorgeous and I love the finish you gave it - it's perfection! PS - Extending the island is a genius move. I was in desperate need of a bigger island but didn't want to replace the one I had - so... when I decided to replace the butcher block top with Corian I extended the size out nearly two feet and a little on the sides too. BEST decision I ever made - And, when I decided to cover the new Corian with cararra later, I went even a bit bigger! It's the perfect solution and makes a world of difference. Yea! hello, I just saw your post and I love it! I have a few questions though. 1. 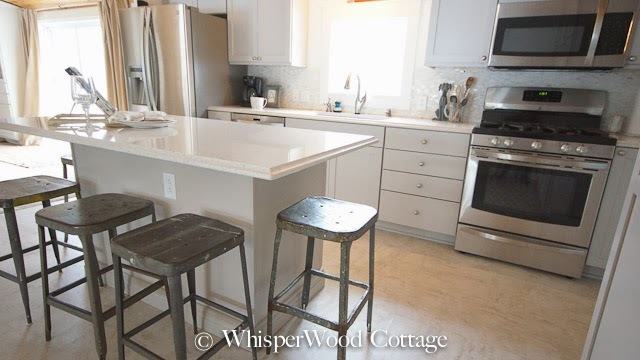 How wide and deep is the base to your island, how big is the countertop, how much overhang and how big are your stools? I know I am asking for a lot of parameters and specifics but we are breaking ground in a little over a week and we have our island with seating on 3 sides like yours, but our base is only 48" with a 12" overhang on 3 sides... any insight is appreciated, we are beyond novice to this stuff! Hi, Mindie. Thank you! Glad to answer your questions. The island is 48x25. 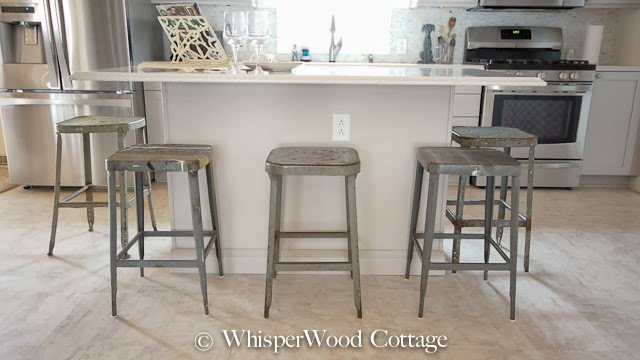 The overhang is 11" on 3 sides, and the stools are 24" high. Seems like your base and overhang are spot on! Plenty of space for meal prep, etc. It's exciting to hear that you are breaking ground. Fabulous!